¶ 3 Leave a comment on paragraph 3 0 The Great Railroad Strike of 1877 heralded a new era of labor conflict in the United States. That year, mired in the stagnant economy that followed the bursting of the railroads’ financial bubble in 1873, rail lines slashed workers’ wages (even, workers complained, as they reaped enormous government subsidies and paid shareholders lucrative stock dividends). Workers struck from Baltimore to St. Louis, shutting down railroad traffic—the nation’s economic lifeblood—across the country. ¶ 4 Leave a comment on paragraph 4 0 Panicked business leaders and friendly political officials reacted quickly. When local police forces would not or could not suppress the strikes, governors called out state militias to break them and restore rail service. Many strikers destroyed rail property rather than allow militias to reopen the rails. The protests approached a class war. The governor of Maryland deployed the state’s militia. In Baltimore, the militia fired into a crowd of striking workers, killing eleven and wounding many more. Strikes convulsed towns and cities across Pennsylvania. The head of the Pennsylvania Railroad, Thomas Andrew Scott, suggested that if workers were unhappy with their wages, they should be given “a rifle diet for a few days and see how they like that kind of bread.” ((David T. Burbank, Reign of the Rabble: The St. Louis General Strike of 1877 (New York: Kelley, 1966), 11.)) Law enforcement in Pittsburgh refused to put down the protests, so the governor called out the state militia, who killed twenty strikers with bayonets and rifle fire. A month of chaos erupted. Strikers set fire to the city, destroying dozens of buildings, over a hundred engines, and over a thousand cars. In Reading, strikers destroyed rail property and an angry crowd bombarded militiamen with rocks and bottles. The militia fired into the crowd, killing ten. A general strike erupted in St. Louis, and strikers seized rail depots and declared for the eight-hour day and the abolition of child labor. Federal troops and vigilantes fought their way into the depot, killing eighteen and breaking the strike. Rail lines were shut down all across neighboring Illinois, where coal miners struck in sympathy, tens of thousands gathered to protest under the aegis of the Workingmen’s Party, and twenty protesters were killed in Chicago by special police and militiamen. ¶ 8 Leave a comment on paragraph 8 0 Growing labor unrest accompanied industrialization. The greatest strikes first hit the railroads only because no other industry had so effectively marshaled together capital, government support, and bureaucratic management. Many workers perceived their new powerlessness in the coming industrial order. Skills mattered less and less in an industrialized, mass-producing economy, and their strength as individuals seemed ever smaller and more insignificant when companies grew in size and power and managers grew flush with wealth and influence. Long hours, dangerous working conditions, and the difficulty of supporting a family on meager and unpredictable wages compelled armies of labor to organize and battle against the power of capital. ¶ 9 Leave a comment on paragraph 9 0 The post–Civil War era saw revolutions in American industry. Technological innovations and national investments slashed the costs of production and distribution. New administrative frameworks sustained the weight of vast firms. National credit agencies eased the uncertainties surrounding rapid movement of capital between investors, manufacturers, and retailers. Plummeting transportation and communication costs opened new national media, which advertising agencies used to nationalize various products. ¶ 11 Leave a comment on paragraph 11 0 Glazier Stove Company, moulding room, Chelsea, Michigan, ca1900-1910. Library of Congress, LC-D4-42785. ¶ 15 Leave a comment on paragraph 15 0 The costs of mass production were prohibitive for all but the very wealthiest individuals, and, even then, the risks would be too great to bear individually. The corporation itself was ages old, but the actual right to incorporate had generally been reserved for public works projects or government-sponsored monopolies. After the Civil War, however, the corporation, using new state incorporation laws passed during the Market Revolution of the early nineteenth century, became a legal mechanism for nearly any enterprise to marshal vast amounts of capital while limiting the liability of shareholders. By washing their hands of legal and financial obligations while still retaining the right to profit massively, investors flooded corporations with the capital needed to industrialize. ¶ 16 Leave a comment on paragraph 16 0 But a competitive marketplace threatened the promise of investments. Once the efficiency gains of mass production were realized, profit margins could be undone by cutthroat competition, which kept costs low as price cutting sank into profits. Companies rose and fell—and investors suffered losses—as manufacturing firms struggled to maintain supremacy in their particular industries. Economies of scale were a double-edged sword: while additional production provided immense profits, the high fixed costs of operating expensive factories dictated that even modest losses from selling underpriced goods were preferable to not selling profitably priced goods at all. And as market share was won and lost, profits proved unstable. American industrial firms tried everything to avoid competition: they formed informal pools and trusts, they entered price-fixing agreements, they divided markets, and, when blocked by antitrust laws and renegade price cutting, merged into consolidations. Rather than suffer from ruinous competition, firms combined and bypassed it altogether. 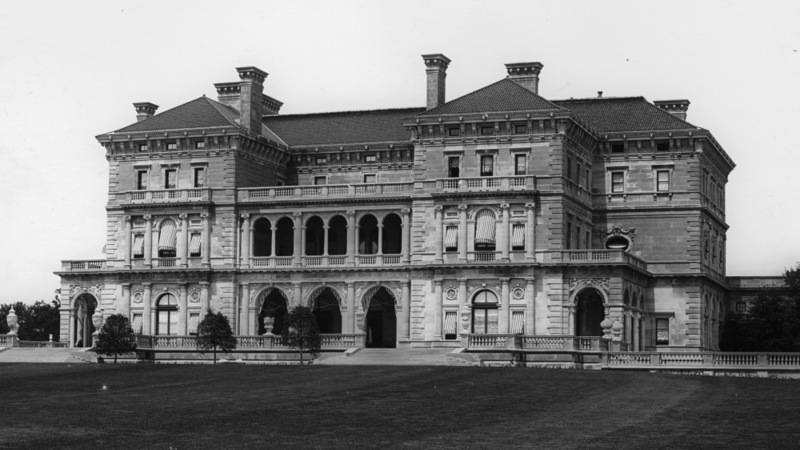 ¶ 19 Leave a comment on paragraph 19 0 The Breakers, Vanderbilt residence, Newport, R.I., ca.1904. Library of Congress, LC-D4-16955. ¶ 25 Leave a comment on paragraph 25 0 But not all so eagerly welcomed inequalities. The spectacular growth of the U.S. economy and the ensuing inequalities in living conditions and incomes confounded many Americans. But as industrial capitalism overtook the nation, it achieved political protections. Although both major political parties facilitated the rise of big business and used state power to support the interests of capital against labor, big business looked primarily to the Republican Party. ¶ 26 Leave a comment on paragraph 26 0 The Republican Party had risen as an antislavery faction committed to “free labor,” but it was also an ardent supporter of American business. Abraham Lincoln had been a corporate lawyer who defended railroads, and during the Civil War the Republican national government took advantage of the wartime absence of southern Democrats to push through a pro-business agenda. The Republican congress gave millions of acres and dollars to railroad companies. Republicans became the party of business, and they dominated American politics throughout the Gilded Age and the first several decades of the twentieth century. Of the sixteen presidential elections between the Civil War and the Great Depression, Republican candidates won all but four. Republicans controlled the Senate in twenty-seven out of thirty-two sessions in the same period. Republican dominance maintained a high protective tariff, an import tax designed to shield American businesses from foreign competition; southern planters had vehemently opposed this policy before the war but now could do nothing to prevent. It provided the protective foundation for a new American industrial order, while Spencer’s social Darwinism provided moral justification for national policies that minimized government interference in the economy for anything other than the protection and support of business. ¶ 28 Leave a comment on paragraph 28 0 Lawrence Textile Strike, 1912. Library of Congress, LC-USZ62-23725. ¶ 29 Leave a comment on paragraph 29 0 The ideas of social Darwinism attracted little support among the mass of American industrial laborers. American workers toiled in difficult jobs for long hours and little pay. 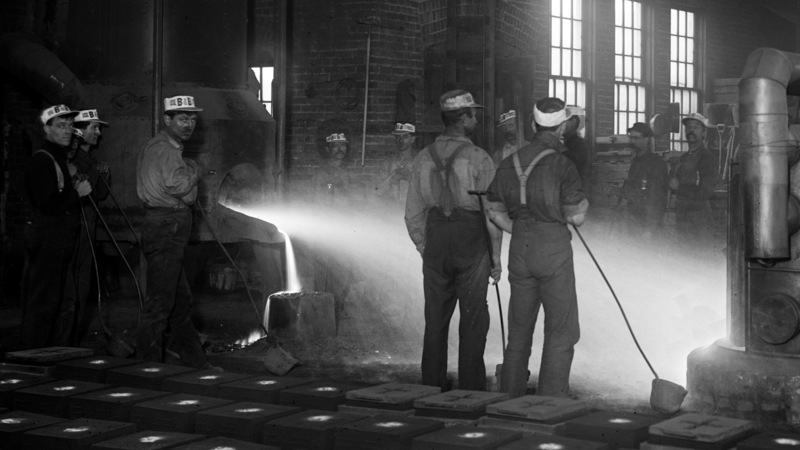 Mechanization and mass production threw skilled laborers into unskilled positions. Industrial work ebbed and flowed with the economy. The typical industrial laborer could expect to be unemployed one month out of the year. They labored sixty hours a week and could still expect their annual income to fall below the poverty line. Among the working poor, wives and children were forced into the labor market to compensate. Crowded cities, meanwhile, failed to accommodate growing urban populations and skyrocketing rents trapped families in crowded slums. ¶ 30 Leave a comment on paragraph 30 0 Strikes ruptured American industry throughout the late nineteenth and early twentieth centuries. Workers seeking higher wages, shorter hours, and safer working conditions had struck throughout the antebellum era, but organized unions were fleeting and transitory. The Civil War and Reconstruction seemed to briefly distract the nation from the plight of labor, but the end of the sectional crisis and the explosive growth of big business, unprecedented fortunes, and a vast industrial workforce in the last quarter of the nineteenth century sparked the rise of a vast American labor movement. ¶ 32 Leave a comment on paragraph 32 0 An 1892 cover of Harper’s Weekly depicting the Homestead Riot, showed Pinkerton men who had surrendered to the steel mill workers navigating a gauntlet of violent strikers. W.P. Synder (artist) after a photograph by Dabbs, “The Homestead Riot,” 1892. Library of Congress, LC-USZ62-126046. ¶ 34 Leave a comment on paragraph 34 2 In the summer of 1886, the campaign for an eight-hour day, long a rallying cry that united American laborers, culminated in a national strike on May 1, 1886. Somewhere between three hundred thousand and five hundred thousand workers struck across the country. ¶ 36 Leave a comment on paragraph 36 0 The American Federation of Labor (AFL) emerged as a conservative alternative to the vision of the Knights of Labor. An alliance of craft unions (unions composed of skilled workers), the AFL rejected the Knights’ expansive vision of a “producerist” economy and advocated “pure and simple trade unionism,” a program that aimed for practical gains (higher wages, fewer hours, and safer conditions) through a conservative approach that tried to avoid strikes. But workers continued to strike. ¶ 38 Leave a comment on paragraph 38 0 Still, despite repeated failure, strikes continued to roll across the industrial landscape. In 1894, workers in George Pullman’s Pullman car factories struck when he cut wages by a quarter but kept rents and utilities in his company town constant. The American Railway Union (ARU), led by Eugene Debs, launched a sympathy strike: the ARU would refuse to handle any Pullman cars on any rail line anywhere in the country. Thousands of workers struck and national railroad traffic ground to a halt. Unlike in nearly every other major strike, the governor of Illinois sympathized with workers and refused to dispatch the state militia. It didn’t matter. 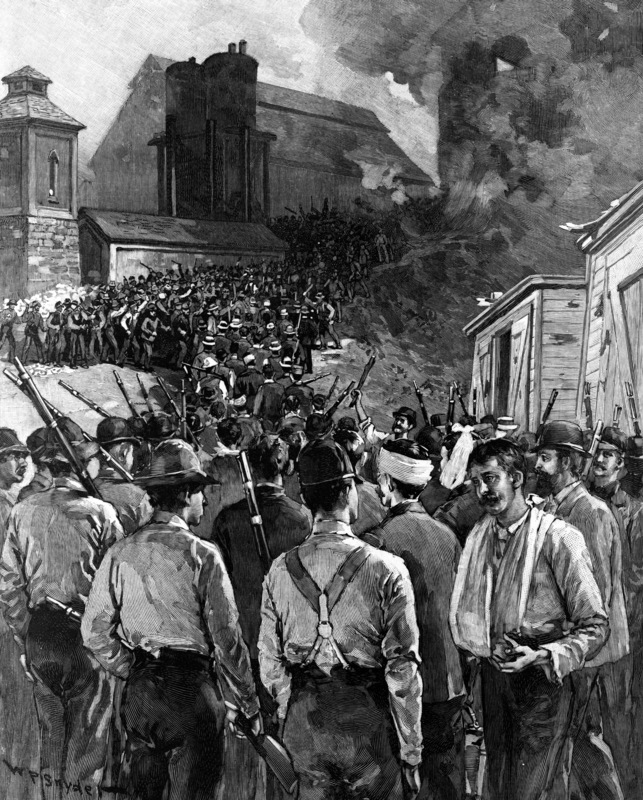 In July, President Grover Cleveland dispatched thousands of American soldiers to break the strike, and a federal court issued a preemptive injunction against Debs and the union’s leadership. The strike violated the injunction, and Debs was arrested and imprisoned. The strike evaporated without its leadership. Jail radicalized Debs, proving to him that political and judicial leaders were merely tools for capital in its struggle against labor. ((Almont Lindsey, The Pullman Strike: The Story of a Unique Experiment and of a Great Labor Upheaval (Chicago: University of Chicago Press, 1943).)) But it wasn’t just Debs. 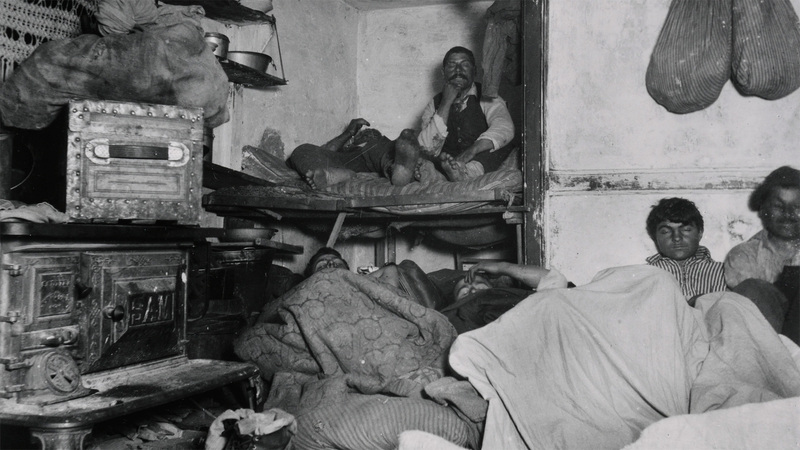 In 1905, the degrading conditions of industrial labor sparked strikes across the country. The final two decades of the nineteenth century saw over twenty thousand strikes and lockouts in the United States. Industrial laborers struggled to carve for themselves a piece of the prosperity lifting investors and a rapidly expanding middle class into unprecedented standards of living. But workers were not the only ones struggling to stay afloat in industrial America. American farmers also lashed out against the inequalities of the Gilded Age and denounced political corruption for enabling economic theft. 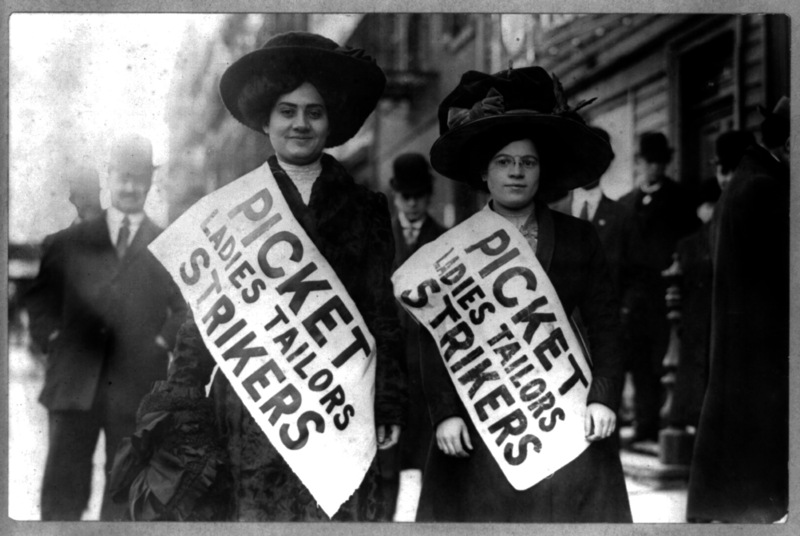 ¶ 39 Leave a comment on paragraph 39 0 Two women strikers on picket line during the “Uprising of the 20,000”, garment workers strike, New York City, 1910. Library of Congress, LC-USZ62-49516 . ¶ 41 Leave a comment on paragraph 41 0 “Wall Street owns the country,” the Populist leader Mary Elizabeth Lease told dispossessed farmers around 1890. “It is no longer a government of the people, by the people, and for the people, but a government of Wall Street, by Wall Street, and for Wall Street.” Farmers, who remained a majority of the American population through the first decade of the twentieth century, were hit especially hard by industrialization. The expanding markets and technological improvements that increased efficiency also decreased commodity prices. Commercialization of agriculture put farmers in the hands of bankers, railroads, and various economic intermediaries. As the decades passed, more and more farmers fell ever further into debt, lost their land, and were forced to enter the industrial workforce or, especially in the South, became landless farmworkers. ¶ 42 Leave a comment on paragraph 42 0 The rise of industrial giants reshaped the American countryside and the Americans who called it home. Railroad spur lines, telegraph lines, and credit crept into farming communities and linked rural Americans, who still made up a majority of the country’s population, with towns, regional cities, American financial centers in Chicago and New York, and, eventually, London and the world’s financial markets. Meanwhile, improved farm machinery, easy credit, and the latest consumer goods flooded the countryside. But new connections and new conveniences came at a price. ¶ 43 Leave a comment on paragraph 43 0 Farmers had always been dependent on the whims of the weather and local markets. But now they staked their financial security on a national economic system subject to rapid price swings, rampant speculation, and limited regulation. Frustrated American farmers attempted to reshape the fundamental structures of the nation’s political and economic systems, systems they believed enriched parasitic bankers and industrial monopolists at the expense of the many laboring farmers who fed the nation by producing its many crops and farm goods. 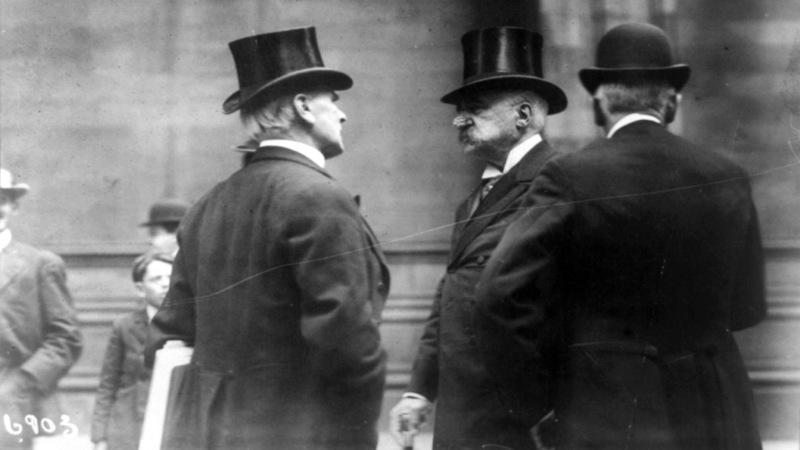 Their dissatisfaction with an erratic and impersonal system put many of them at the forefront of what would become perhaps the most serious challenge to the established political economy of Gilded Age America. Farmers organized and launched their challenge first through the cooperatives of the Farmers’ Alliance and later through the politics of the People’s (or Populist) Party. ¶ 45 Leave a comment on paragraph 45 0 The banner of the first Texas Farmers’ Alliance. Source: N. A. Dunning (ed. ), Farmers’ Alliance History and Agricultural Digest (Washington D.C.: Alliance Publishing Co., 1891), iv. ¶ 46 Leave a comment on paragraph 46 0 The alliance’s most innovative programs were a series of farmers’ cooperatives that enabled farmers to negotiate higher prices for their crops and lower prices for the goods they purchased. These cooperatives spread across the South between 1886 and 1892 and claimed more than a million members at their high point. While most failed financially, these “philanthropic monopolies,” as one alliance speaker termed them, inspired farmers to look to large-scale organization to cope with their economic difficulties. ((Lawrence Goodwyn argued that the Populists’ “cooperative vision” was the central element in their hopes of a “democratic economy.” Goodwyn, Democratic Promise, 54.)) But cooperation was only part of the alliance message. ¶ 48 Leave a comment on paragraph 48 0 At that meeting the party adopted a platform that crystallized the alliance’s cooperate program into a coherent political vision. The platform’s preamble, written by longtime political iconoclast and Minnesota populist Ignatius Donnelly, warned that “the fruits of the toil of millions [had been] boldly stolen to build up colossal fortunes for a few.” ((Edward McPherson, A Handbook of Politics for 1892 (Washington, DC: Chapman, 1892), 269.)) Taken as a whole, the Omaha Platform and the larger Populist movement sought to counter the scale and power of monopolistic capitalism with a strong, engaged, and modern federal government. The platform proposed an unprecedented expansion of federal power. It advocated nationalizing the country’s railroad and telegraph systems to ensure that essential services would be run in the best interests of the people. In an attempt to deal with the lack of currency available to farmers, it advocated postal savings banks to protect depositors and extend credit. It called for the establishment of a network of federally managed warehouses—called subtreasuries—which would extend government loans to farmers who stored crops in the warehouses as they awaited higher market prices. To save debtors it promoted an inflationary monetary policy by monetizing silver. Direct election of senators and the secret ballot would ensure that this federal government would serve the interest of the people rather than entrenched partisan interests, and a graduated income tax would protect Americans from the establishment of an American aristocracy. Combined, these efforts would, Populists believed, help shift economic and political power back toward the nation’s producing classes. ¶ 50 Leave a comment on paragraph 50 0 The movement, however, still faced substantial obstacles, especially in the South. The failure of alliance-backed Democrats to live up to their campaign promises drove some southerners to break with the party of their forefathers and join the Populists. Many, however, were unwilling to take what was, for southerners, a radical step. Southern Democrats, for their part, responded to the Populist challenge with electoral fraud and racial demagoguery. Both severely limited Populist gains. 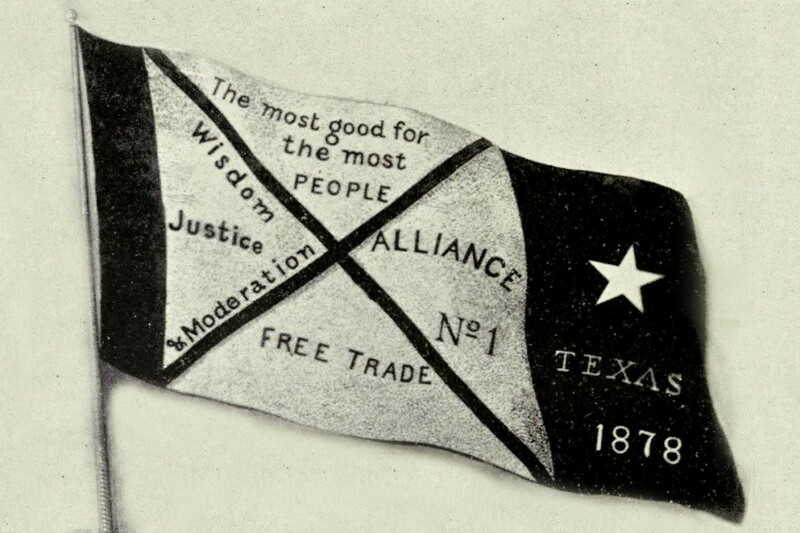 The alliance struggled to balance the pervasive white supremacy of the American South with their call for a grand union of the producing class. American racial attitudes—and their virulent southern strain—simply proved too formidable. Democrats race-baited Populists, and Populists capitulated. The Colored Farmers’ Alliance, which had formed as a segregated sister organization to the southern alliance and had as many as 250,000 members at its peak, fell prey to racial and class-based hostility. The group went into rapid decline in 1891 when faced with the violent white repression of a number of Colored Farmers’ Alliance–sponsored cotton picker strikes. Racial mistrust and division remained the rule, even among Populists, and even in North Carolina, where a political marriage of convenience between Populists and Republicans resulted in the election of Populist Marion Butler to the Senate. Populists opposed Democratic corruption, but this did not necessarily make them champions of interracial democracy. As Butler explained to an audience in Edgecombe County, “We are in favor of white supremacy, but we are not in favor of cheating and fraud to get it.” ((Postel, Populist Vision, 197.)) In fact, across much of the South, Populists and Farmers’ Alliance members were often at the forefront of the movement for disfranchisement and segregation. ¶ 51 Leave a comment on paragraph 51 1 Populism exploded in popularity. The first major political force to tap into the vast discomfort of many Americans with the disruptions wrought by industrial capitalism, the Populist Party seemed poise to capture political victory. And yet, even as Populism gained national traction, the movement was stumbling. The party’s often divided leadership found it difficult to shepherd what remained a diverse and loosely organized coalition of reformers toward unified political action. The Omaha platform was a radical document, and some state party leaders selectively embraced its reforms. More importantly, the institutionalized parties were still too strong, and the Democrats loomed, ready to swallow Populist frustrations and inaugurate a new era of American politics. ¶ 53 Leave a comment on paragraph 53 0 William Jennings Bryan, 1896. Library of Congress, LC-USZC2-6259. ¶ 55 Leave a comment on paragraph 55 0 Bryan was born in Salem, Illinois, in 1860 to a devout family with a strong passion for law, politics, and public speaking. At twenty, he attended Union Law College in Chicago and passed the bar shortly thereafter. After his marriage to Mary Baird in Illinois, Bryan and his young family relocated to Nebraska, where he won a reputation among the state’s Democratic Party leaders as an extraordinary orator. Bryan later won recognition as one of the greatest speakers in American history. ¶ 56 Leave a comment on paragraph 56 1 When economic depressions struck the Midwest in the late 1880s, despairing farmers faced low crop prices and found few politicians on their side. While many rallied to the Populist cause, Bryan worked from within the Democratic Party, using the strength of his oratory. After delivering one speech, he told his wife, “Last night I found that I had a power over the audience. I could move them as I chose. I have more than usual power as a speaker. . . . God grant that I may use it wisely.” ((Ibid., 25. ))He soon won election to the Nebraska House of Representatives, where he served for two terms. Although he lost a bid to join the Nebraska Senate, Bryan refocused on a much higher political position: the presidency of the United States. There, he believed he could change the country by defending farmers and urban laborers against the corruptions of big business. ¶ 57 Leave a comment on paragraph 57 0 In 1895–1896, Bryan launched a national speaking tour in which he promoted the free coinage of silver. He believed that bimetallism, by inflating American currency, could alleviate farmers’ debts. In contrast, Republicans championed the gold standard and a flat money supply. American monetary standards became a leading campaign issue. Then, in July 1896, the Democratic Party’s national convention met to choose their presidential nominee in the upcoming election. The party platform asserted that the gold standard was “not only un-American but anti-American.” Bryan spoke last at the convention. He astounded his listeners. At the conclusion of his stirring speech, he declared, “Having behind us the commercial interests and the laboring interests and all the toiling masses, we shall answer their demands for a gold standard by saying to them, you shall not press down upon the brow of labor this crown of thorns. 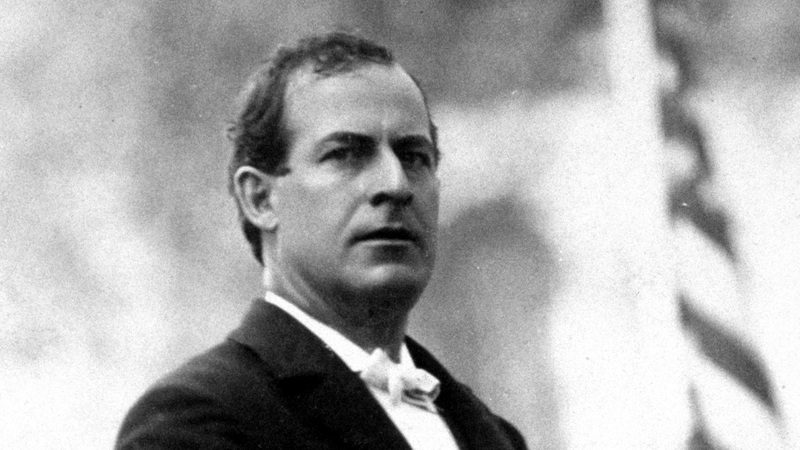 You shall not crucify mankind upon a cross of gold.” ((Richard Franklin Bensel, Passion and Preferences: William Jennings Bryan and the 1896 Democratic Convention (Cambridge, UK: Cambridge University Press, 2008), 232.)) After a few seconds of stunned silence, the convention went wild. Some wept, many shouted, and the band began to play “For He’s a Jolly Good Fellow.” Bryan received the 1896 Democratic presidential nomination. ¶ 59 Leave a comment on paragraph 59 0 In early 1900, Congress passed the Gold Standard Act, which put the country on the gold standard, effectively ending the debate over the nation’s monetary policy. 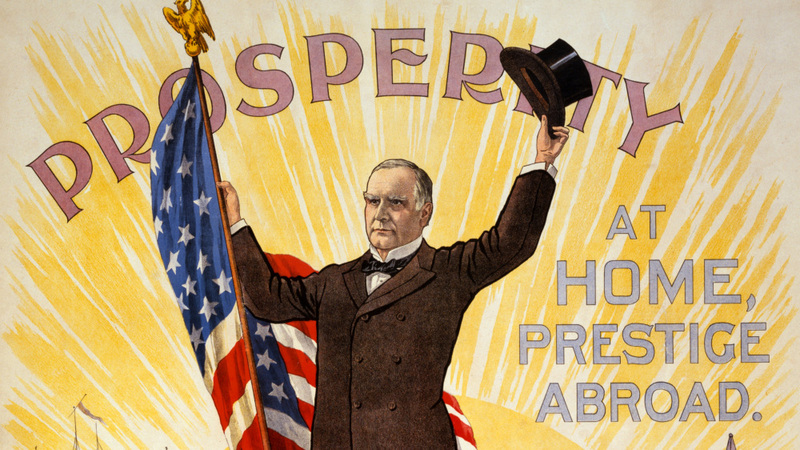 Bryan sought the presidency again in 1900 but was again defeated, as he would be yet again in 1908. ¶ 61 Leave a comment on paragraph 61 0 William Jennings Bryan espoused Populist politics while working within the two-party system as a Democrat. Republicans characterized this as a kind hijacking by Bryan, arguing that the Democratic Party was now a party of a radical faction of Populists. 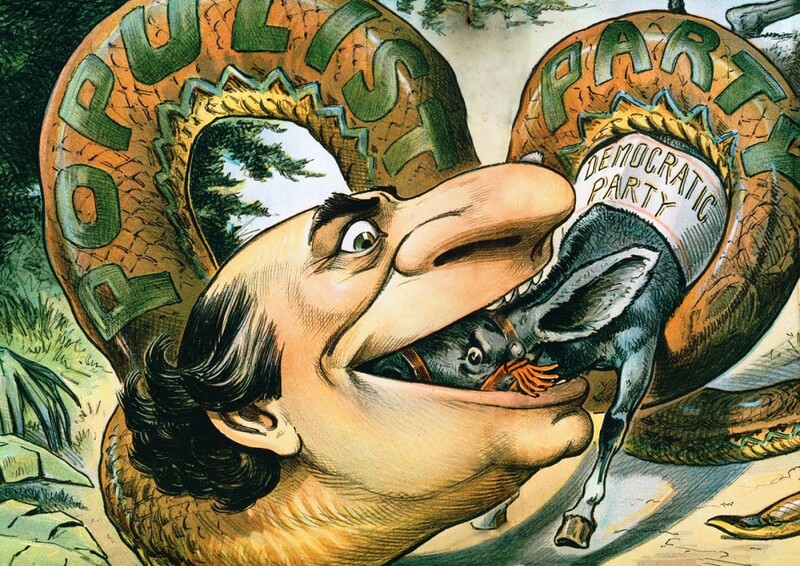 The pro-Republican magazine Judge rendered this perspective in a political cartoon showing Bryan (representing Populism writ large) as huge serpent swallowing a bucking mule (representing the Democratic party). Political Cartoon, Judge, 1896. Wikimedia. 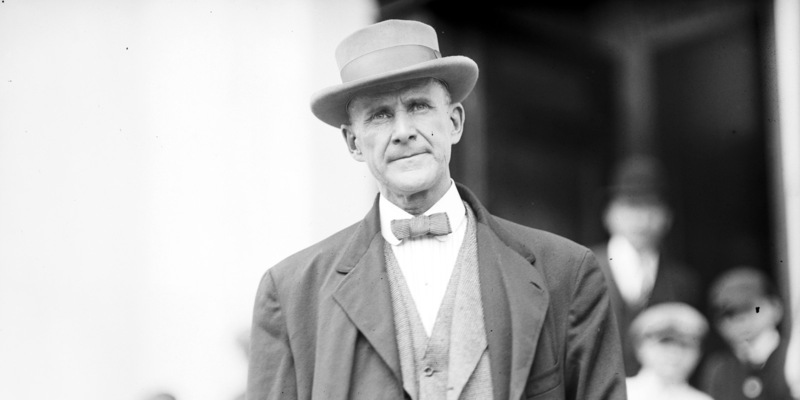 ¶ 64 Leave a comment on paragraph 64 0 American socialist leader Eugene Victor Debs, 1912. Library of Congress, LC-DIG-hec-01584. ¶ 65 Leave a comment on paragraph 65 0 The socialist movement drew from a diverse constituency. Party membership was open to all regardless of race, gender, class, ethnicity, or religion. Many prominent Americans, such as Helen Keller, Upton Sinclair, and Jack London, became socialists. They were joined by masses of American laborers from across the United States: factory workers, miners, railroad builders, tenant farmers, and small farmers all united under the red flag of socialism. Many united with labor leader William D. “Big Bill” Haywood and other radicals in 1905 to form the Industrial Workers of the World (IWW), the “Wobblies,” a radical and confrontational union that welcomed all workers, regardless of race or gender. ((Philip S. Foner, The Industrial Workers of the World 1905–1917 (New York: International Publishers, 1965.))) Others turned to politics. ¶ 67 Leave a comment on paragraph 67 0 Over the following years, however, the embrace of many socialist policies by progressive reformers, internal ideological and tactical disagreements, a failure to dissuade most Americans of the perceived incompatibility between socialism and American values, and, especially, government oppression and censorship, particularly during and after World War I, ultimately sank the party. Like the Populists, however, socialists had tapped into a deep well of discontent, and their energy and organizing filtered out into American culture and American politics. ¶ 69 Leave a comment on paragraph 69 0 The march of capital transformed patterns of American life. While some enjoyed unprecedented levels of wealth, and an ever-growing slice of middle-class workers won an ever more comfortable standard of living, vast numbers of farmers lost their land and a growing industrial working class struggled to earn wages sufficient to support themselves and their families. Industrial capitalism brought wealth and it brought poverty; it created owners and investors and it created employees. But whether winners or losers in the new economy, all Americans reckoned in some way with their new industrial world. William Graham Sumner, a sociologist at Yale University, penned several pieces associated with the philosophy of Social Darwinism. In the following, Sumner explains his vision of nature and liberty in a just society. Andrew Carnegie, the American steel titan, explains his vision for the proper role of wealth in American society. In 1912, The International Workers of the World (the IWW, or the “Wobblies”) organized textile workers in Lawrence and Lowell, Massachusetts. 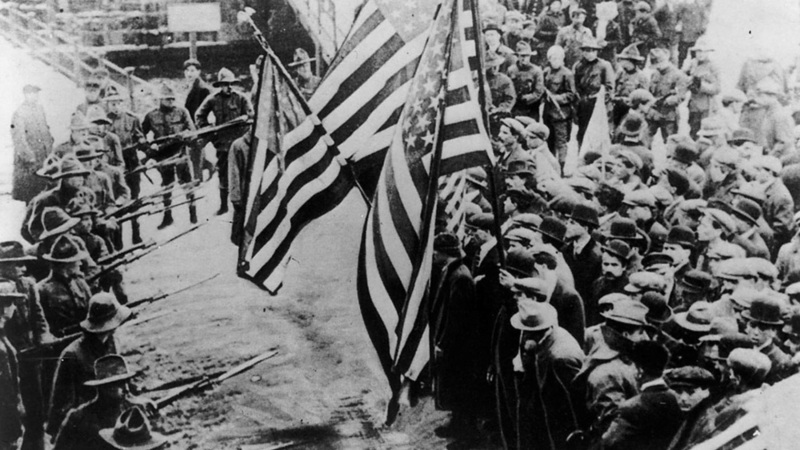 This photo shows strikers, carrying American flags, confronting strikebreakers and militia bayonets. ¶ 86 Leave a comment on paragraph 86 0 This chapter was edited by Joseph Locke, with content contributions by Andrew C. Baker, Nicholas Blood, Justin Clark, Dan Du, Caroline Bunnell Harris, David Hochfelder Scott Libson, Joseph Locke, Leah Richier, Matthew Simmons, Kate Sohasky, Joseph Super, and Kaylynn Washnock. ¶ 87 Leave a comment on paragraph 87 0 Recommended citation: Andrew C. Baker et al., “Capital and Labor,” Joseph Locke, ed., in The American Yawp, eds. Joseph Locke and Ben Wright (Stanford, CA: Stanford University Press, 2018). Benson, Susan Porter. Counter Cultures: Saleswomen, Managers, and Customers in American Department Stores, 1890–1940. Champaign: University of Illinois Press, 1986. Cameron, Ardis. Radicals of the Worst Sort: Laboring Women in Lawrence, Massachusetts, 1860–1912. Champaign: University of Illinois Press, 1993. Chambers, John W. The Tyranny of Change: America in the Progressive Era, 1890–1920, 2nd ed. New Brunswick, NJ: Rutgers University Press, 2000. Chandler, Alfred D., Jr., The Visible Hand: The Managerial Revolution in American Business. Cambridge, MA: Belknap Press, 1977. Chandler, Alfred D., Jr. Scale and Scope: The Dynamics of Industrial Capitalism. Cambridge, MA: Harvard University Press, 1990. Fink, Leon. Workingmen’s Democracy: The Knights of Labor and American Politics. Chicago: University of Illinois Press, 1993. Green, James. Death in the Haymarket: A Story of Chicago, the First Labor Movement, and the Bombing That Divided Gilded Age America. New York City: Pantheon Books, 2006. Hofstadter, Richard. Social Darwinism in American Thought. Philadelphia: University of Pennsylvania Press, 1944. Johnson, Kimberley S. Governing the American State: Congress and the New Federalism, 1877–1929. Princeton, NJ: Princeton University Press, 2006. Krause, Paul. The Battle for Homestead, 1880–1892: Politics, Culture, and Steel. Pittsburgh, PA: University of Pittsburgh Press, 1992. Lamoreaux, Naomi R. The Great Merger Movement in American Business, 1895–1904. New York: Cambridge University Press, 1985. Painter, Nell Irvin. Standing at Armageddon: The United States, 1877–1919. New York: Norton, 1987. Postel, Charles. The Populist Vision. New York: Oxford University Press, 2009.